Welcome to “For Your Glass Only”. My love of wine began when my husband’s mom, "Virginia" asked me if I wanted a glass. That was 22 years ago. Thus, began my love affair! I soon found out though, I didn't like sharing my wine with anyone...and so my quest began, to find a glass marker that would meet my needs. I didn’t like the clatter some makers made and being a cancer survivor I was leery of magnets. That’s how “For Your Glass Only” came to being. It wasn’t until my daughter requested a marker that would work with her new “stemless wine glasses” that I began to work on my current creation. Coming up with something that would work was a challenge. It had to stay on the rim, not scratch the glass and be easy to attach and remove. It took me about a year to perfect my design, which is now patent-pending. 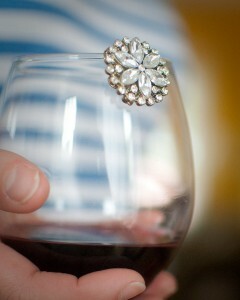 Each wine glass rim marker is hand crafted and inspected for both quality and aesthetic purposes. Every one is tried on a glass before its approved to go into the world and identify your glass. There’s no more guessing which glass is yours with “For Your Glass Only".